As the weather turns from glorious sunshine filled skies to dull and gloomy wet days I received a wonderful parcel. 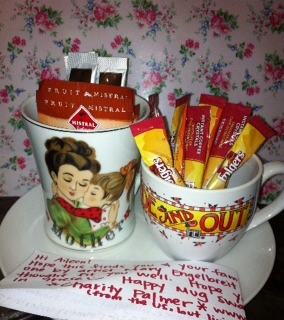 A while back I signed up to take part in #Mugswap2013 through the social application Instagram. I use this application to capture precious moments to look back on of my children’s lives ( to be thankful for) and more recently to record my meals throughout the day. I am on a mission to shed some weight and get fit but that’s a whole different blog in itself. After being soaked taking one of our children up to the local nursery on foot, (it was not all bad we did stop and throw sycamore helicopters and take in the sights of nature changing around us too) then enduring the long journey home with my strong willed 2 year old the postman brought me the most awesome gift. I began to wonder what the parcel may be, Did I order something via Ebay and forget?? Carefully peeling back the sellotape I was like a child at Christmas. In everyday life, those who know me well are aware I do not like getting gifts/ presents normally. I have a number of allergies- I cant eat a lot of chocolate due to a serious nut allergy, or wear perfume /toiletries because I am allergic. A shopping nightmare! The one exception being my most treasured diamond earrings gifted to me on my wedding day from my husband. I hate the feeling of surprise/ gifts so this sensation was totally knew to me. In a haze of post summer holiday madness it dawned on me that this may be my #Mugswap2013 gift. Of the many pleasures life can bestow upon us a good cup of tea is one which I revel in. I think also it’s something which is inbuilt being British. Something bad happens – have a cup of tea to calm your nerves, something amazing like giving birth occurs – and the midwife brings you a pot of tea accompanied by thee most awesome buttery toast. When applying to take part in the swap you had to provide a brief description of yourself, your likes, pastimes and hobbies. I do not think this generous stranger could have got my gift any better. I adore art and my 6 children are my life the mug I received depicts and image of a Mother by artist Mary Engelbreit with a gilded inscription of the word ‘Mother’ in fancy script, -so me. Alongside this was another small mug with the words ‘Be warm inside and out ‘ on. 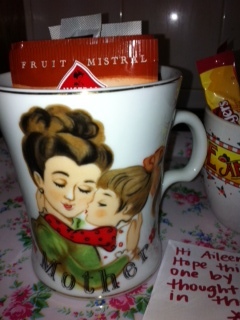 It was all packaged beautifully in colourful tissue paper with a collection of a sachets of coffees, tea and herbal tea. I am astounded by this strangers generosity. My heart is filled with cheer and happiness all from a small act of kindness from an unknown lady. I only hope the package which I put together when I receive my remit will enlighten the day of the recipient as much as this has mine. I take from the experience the exact words which are upon one of my new mugs ‘Be warm inside and out’. It is all too easy to show acts of kindness to your loved ones in everyday life for their happiness is of most importance to you . But I believe that we should all look beyond our own lives and show kindness out with our immediate family circles. I am unsure just how i can execute this but it has given me a lot to think about so #Mugswap2013 I thank you. As children all over Scotland are preparing for a return back to school new pencils cases filled, new school shoes bought and excitement is in the air. At the same time I hear a big sigh of relief as parent welcome the start of a new term. 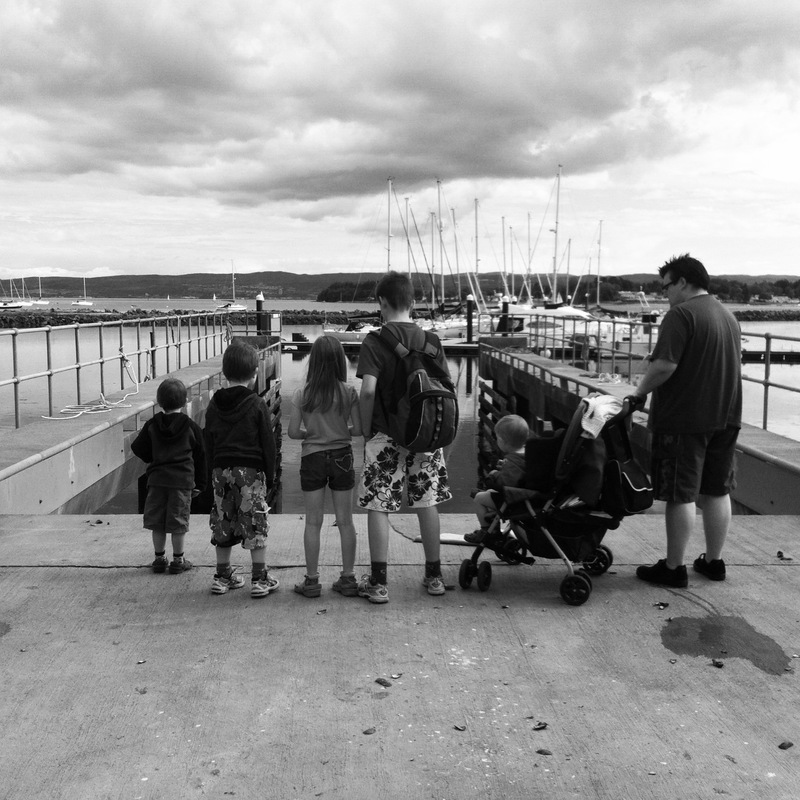 Being a Mum of 6 throws challenges at you almost every day, Squabbling,Fussy eating and general child related issues. The challenge we were not ready for was that my partner in crime and tag team member would get ill. Especially after our busy start to the holidays after our youngest daughters corrective foot surgery. It is wrong that the person who you have looked to for strength and protection now appears to be so unwell. So many many adjustments have had to be made. I am thankful for my understanding children and my close friends for their love and support during this incredibly hard time. I am pushing my anger and frustration for this heart condition my husband has developed into getting fitter and will be taking part in a Road Block Run. I am by no means a runner/ jogger so I had best get my sneakers on and get warmed up and prepared for the event. I am hoping to raise some money for this worthwhile charity. If you could spare a couple of pounds I would be very thankful.